Easter is coming and I’m almost as excited as when I’m waiting for Christmas. I have family coming (Annie and Josh and their friends) for Easter weekend, which is, in itself, something to celebrate because our families are spread across the country these days. AND, it’s General Conference weekend. For those of you who don’t know about Conference Weekend, it’s going to sound dreadful, but trust me, for Mormons, it’s one of the best weekends of the year. Conference weekend is when our Church broadcasts HOURS of meetings featuring talks from our Church leaders. And, believe me, it’s an event. It happens at the Conference Center in Salt Lake City, which is a 1.4 million square foot building that will seat 21,000 guests. I’m already wondering what we’re going to learn. Mostly, I’m excited about the warm, beautiful spirit of Jesus Christ that will fill my house during Easter weekend. 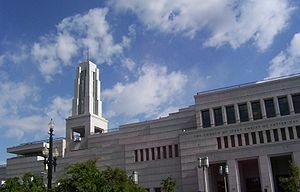 That spirit begins to seep in as soon as I hear the organ music coming from the colossal 7,667-pipe organ at the Conference Center in Salt Lake City. This is no ordinary organ. It’s a pipe organ with 160 stops spread over five manuals and pedals. And since I don’t have a clue what any of that means, I had to look it up. I learned a “manual” is basically a keyboard and the pedals are keyboards for your feet. The stops control the pipes 7,000-plus pipes. All this together makes for some amazing sounds. Add 360 singers to that from the Mormon Tabernacle Choir, and it’s quite a musical experience. And then there are the speakers – about 30 of them spread out over five two-hour sessions. I know, I know. It sounds long and boring — sitting for hours and listening to one Church speaker after another. But I love listening to words on hope, faith, light and truth, parenting, building strong families and improving marriages, making wise choices, receiving personal revelation, sharing the light of Christ, and becoming a better person. “Conference,” as we call it, is a uniquely Mormon experience, and being the odd bunch that we are, we relish every moment of it. When it’s over, we feel some mixed emotions — buoyed up because we’ve been given a heavy dose of counsel and encouragement and spiritual rejuvenation, but sad because we have to turn off our TVs and move out of the warmth of our conference bubble and get back to real life. While most Christians will be attending Easter services on Sunday, Mormons will be home watching television. Something about that doesn’t seem right, but for us, it’s a form of united devotion. It happens the first weekends of October and April every year. This year, it happens to fall on Easter Sunday. While it might seem wrong that our chapels will be closed on Easter Sunday this year, we will be tucked into our cozy nests listening to every word from our leaders—all of which will testify of our love and devotion of Jesus Christ, our Savior and Redeemer. In a way, we will get to enjoy the most intimate kind of Easter worship of all – surrounded by our families in the warmth of our homes. We might not be in our Easter dresses, bonnets and white gloves this Sunday, but you can be sure we will be honoring our Lord and Savior, Jesus Christ and loving every minute of it.